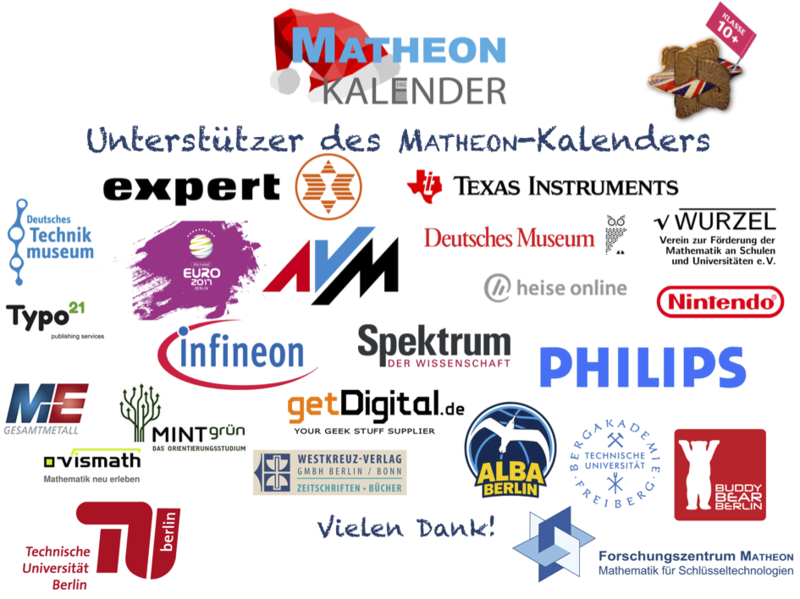 Also this year the Matheon-Kalender is supported by numerous companies with attractive prizes. Our list of prizes will be regularly updated during the competition. You can check how to join the contest in the rules of the game. Matheon-Kalender is looking for donors! We here at the Matheon Research Center in Berlin, Germany, organize the acquainted math Advent calender each year. We propose a riddle each day from December 1 until December 24. The Matheon-Kalender has intrigued pupils, students and adults for the last 13 years now. This year we want to reach an even bigger audience by offering the calendar in English as well. We are looking for donors of material prizes or vouchers, which we want to hand out to the most succesful participants. The prizes are a great motivation for the participants. You will be listed as an offcial donor on our site www.mathekalender.de/matheon together with a list of the prizes you contributed. You will be explicitely named and thanked at the grand prize ceremony in January in Berlin. You can also hand over your prize in person and get a stand for your company in the lobby. We will advertise your company with your logo and the prizes you want to contribute on our facebook page and other marketing channels. Please dont hesitate to contact us to discuss any questions or ideas you may have! 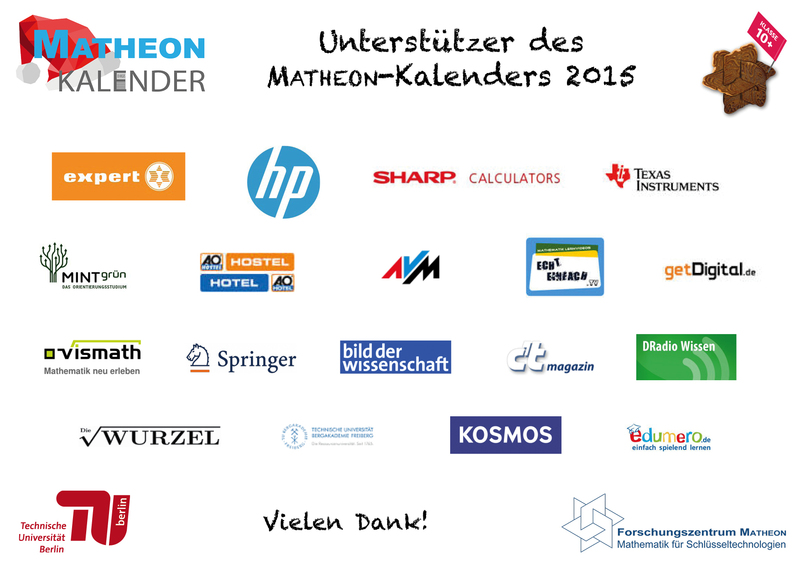 We extend our most special thanks to our sponsors of the Matheon-Kalender 2015 & 2016 for their support. If you are also interested in sponsoring the calendar with prizes, please do not hesitate to contact us.